This handling and footwork drill focuses on moving quickly around the mannequin and being in a good set position to deal with the serve effectively. This drill focuses on two serves testing the ability to produce quick footwork & then handle the ball successfully using different handling techniques. The GK starts by moving from the back of the mannequin to the front, touching a cone and then setting for a serve into the body. After returning the ball to the first server, they move out of the way for a second strike from the second server. 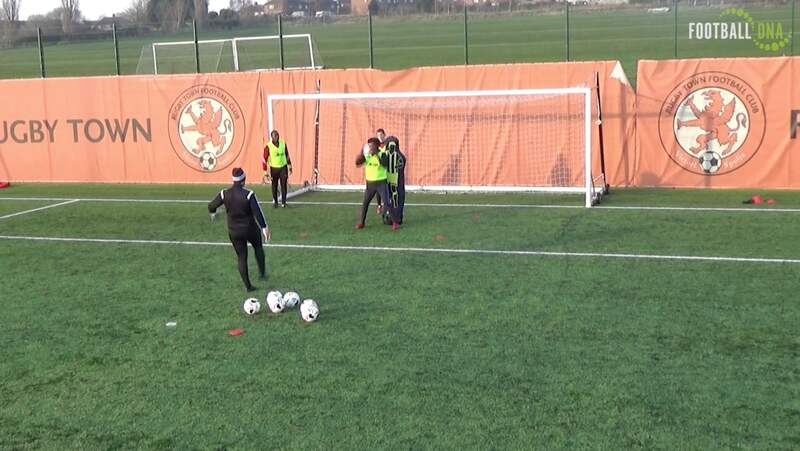 A double goalkeeping action drill starting with the goalkeeper with a ball in hands. They throw the ball to the side before dealing with a long range strike. After this strike they then deal with a 1 v 1 either smothering the ball or staying up on their feet waiting for the attacker to shoot or a poor touch to pounce on.